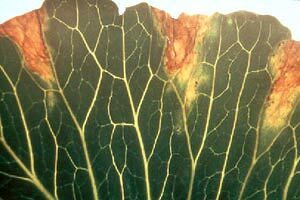 This bacterial disease affects all cabbage family crops. It is present throughout most of North America, but is more common in the East. Infected young seedlings turn yellow and die. Older plants develop yellow, wedge-shaped areas at leaf edges that spread toward the center of the leaf. The veins within this dead tissue turn black. Older leaves at the base of the plant are affected first. Symptoms may first occur primarily on one side of the plant. As the disease progresses, the head may begin to rot. Black rot is spread by insects, splashing water, and contaminated tools. Warm, humid weather encourages this disease, which can persist on plant residues in the soil for 2 years. Plant certified disease-free seed and transplants. Destroy infected plants. Avoid irrigation methods that wet the tops of plants. Use a 2-year crop rotation between susceptible plants. This article is a part of our Pest Control Library.